In 1877 the Sheffield FA adopted the FA Rules after several years of trying to find compromises. Sheffield FA and Football Association organized a game for December 2, 1871 with Sir John Charles Clegg, a game between selections of both associations to try out the rules of the other. Shaw and Alcock were the captains of the two selections. But no agreement was reached yet. But in 1872, the FA took the corner kick of the Sheffield FA Rules. In 1875, the offside rule of the FA Rules was not adopted (everyone standing in front of the leader is offside, when less than three opposite players were between) by the Sheffield FA, who know this rule with „less than two opposite players“. These were not adopted only because the Londoners did not show „a more conciliatory spirit“ (Sheffield Daily Telegraph1)Cf. Sheffield Football Association. In: Sheffield Daily Telegraph, 26.02.1875, p. 3. ) and / or the Londoners did not want to adopt the Sheffield kick-off rule (Sheffield FA Rules of 1875) as a quid pro quo. The minute book of the Sheffield FA mentioned that otherwise both codes would have been combined („the immediate amalgamation of the two codes“), according to which both associations followed. However, in Sheffield from 1875, the goal measures corresponded to these of the FA Rules – in contrary to the law in their code. On 24th February 1875 there had been a general meeting of the FA, where Royal Engineers wanted to change rule 5 (throw-in) according to the Sheffield FA Rules to a kick-in. The Sheffield FA supported the proposal and was willing to adopt the FA Rules in this case. C. W. Alcock also supported this proposal. But there was a big opposition and a long discussion. In the end two more people voted against the proposal. Already in 1867, 1872 and 1874 there had been a proposal from Sheffield to adopt their offside rule, which wasn’t adopted. On April 17, 1877, there was an extraordinary general meeting of the FA, two month after the last one. The only point of discussion was to reconsider the rejection of the amendment to Rule 5. This time the proposal came from Clydesdale Club of Glasgow. There was another discussion, but finally 33 voted for and 10 against the proposal. The Sheffield Daily Telegraph of 18 April 1877 sums up: „[…], so that now London and Sheffield will have one code of rules.“. On April 23, 1877, the Sheffield FA held an extraordinary general meeting and accept the adoption of the FA Rules. 2)Cf. Sheffield FA Rules. In: Sheffield and Rotherham Independent, 23.04.1877, p. 7. In fact, 1875 the codices of the Sheffield FA and the FA hardly differed any more. The Sheffield FA Rules of 1876 and the FA Rules of 1875 even have almost the same order of the rules. The rules for changing of ends (law 3), how a goal is scored (law 4), touch (law 7), handling game (law 8), the indirect free kick (laws 9 or 11+12) and footwear (laws 11 or 10) were the same in both sets of rules in 1875 and 1876, respectively, and remained the same in 1877. The rule on the offside rule (law 6) previously disputed in Sheffield has now been adopted by Sheffield („When a player kicks the ball, any one of the same side who, at such moment of kicking, is nearer to the opponents‘ goal-line, is out of play, and may not touch the ball himself, nor in any way whatever prevent any other player from doing so until the ball has been played, unless there are at least three of his opponents nearer their own goal-line; but no player is out of play when the ball is kicked from the goal-line; but no player is out of play when the ball is kicked from the goal from the goal.“). In the rules of February 1877 there is of course still the throw-in, which was changed in April to the kick-in, as already usual in the Sheffield FA. 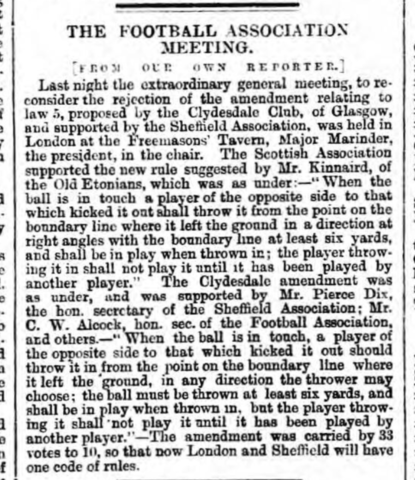 Sheffield also adopted the rule that the pitch may measure a minimum of 100×50 yd ( law1), the winner of the toss may choose between the kick-off and side selection (law 2), and that the FA rules on the referee were much shorter and more general: In the event of a violation of the laws 6 [offside], 8 [handball], 9 [illegal play] and 10 [footwear], the ball remains in play until the umpires decide otherwise – but they can only do so after complaints. The FA-umpires only reacted to an appeal. These were all differences. The FA Rules changed only slightly from 1875, mostly in favour of the FA Rules or by linguistic, but no content adjustments. The header shows the newspaper report „The Football Association Meeting“ from April 18, 1877 in the Sheffield Daily Telegraph. Cite this article as: Petra Tabarelli: Sheffield FA and London FA 1877. In: Nachspielzeiten, 4. Juni 2018. URL: https://nachspielzeiten.de/sheffield-fa-and-london-fa-1877-2/ (zuletzt aufgerufen: 20. April 2019). 1. ↑ Cf. Sheffield Football Association. In: Sheffield Daily Telegraph, 26.02.1875, p. 3. 2. ↑ Cf. Sheffield FA Rules. In: Sheffield and Rotherham Independent, 23.04.1877, p. 7.